You are deep in study for a test or researching in preparation for writing a paper, and you stumble across BLIMMIX, a word with which you are totally unfamiliar. You don’t want to stop and get out your dictionary (Why? What have you got against dictionaries? See below.). Does this mean you’re going to have to carry on reading, hoping the word wasn’t all that important anyway? First of all, of course it’s important. To a writer, all words are important. Also, you may well be able to understand the word without looking it up. Often we can figure out a word’s meaning in context—that is, when the word is used in such a way that the surrounding passages provide clues to its meaning. There are a number of ways in which this can be done. The text in which the offending word is nestled may give us helpful context clues. Here are three ways in which context may provide us with the meaning of BLIMMIX. By giving examples. If the sentence reads, “Blimmixes come in a huge variety, ranging from owls to hummingbirds, from eagles to sparrows,” you’d be justified in guessing that blimmixes are birds. Because the text has provided you with related examples of the sort of thing a blimmix is, you can see what those examples have in common and apply that common denominator to the word. By comparing/contrasting. If the sentence reads, “Most turtles live in moist areas near water, but the Gopherus agassizii makes its home in the blimmix,” you’d reasonably guess that a blimmix is some kind of desert. By using and appealing to reason. If the sentence reads, “Its putrid, malodorous surroundings do not bother the splodge, since it has no sense of blimmix,” you’d figure that “blimmix” probably means “smell,” since “putrid and malodorous” refer to smells (although you still wouldn’t know what a splodge is). There are, after all, only five senses, and “smell” is the only one that detects putrid odors. Learning to tease out the meaning of unfamiliar words by paying close attention to the surrounding text is an excellent skill for any student to cultivate: it makes us alert, attentive readers. Still, what about those alert readers who still don’t know what “splodge” (not to mention “putrid” and “malodorous”) means? Won’t they have to give up and consult a dictionary? Well, yes, and what’s wrong with that? 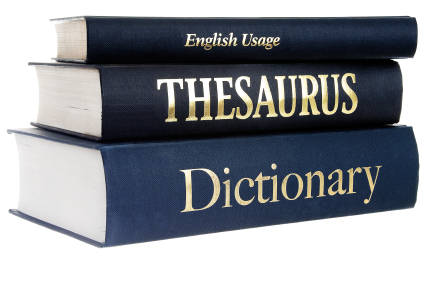 Even if you don’t own a good dictionary and keep it handy, there are helpful free dictionaries available online. You should acquaint yourself with them. When you have a spare moment, do some online research. Find a free dictionary that not only gives you the spelling and meaning and pronunciation of a word but also supplies synonyms for it and tells you what part(s) of speech the word is, and provides examples showing how to use it. Dictionaries are wonderfully informative. Consulting a good one should not be a chore. Also, an online dictionary (as opposed to a print dictionary) won’t make you thumb through a huge alphabetized list. All you’ll have to do is enter the word in a search box and presto: The blimmix is a night-hunting short-winged Amazonian bat. There you go! SO: Get yourself a good dictionary or bookmark one in your browser and use it whenever you can. And while you read, keep an eye out for context clues to enrich your understanding of what you’re reading. As a bonus, this works for conversation as well. If I say, “I’ve forgotten my blimmixes,” you won’t have a clue. But if I say, “I’ve forgotten my blimmixes, so I won’t be able to read the menu,” you’ll probably figure it out! Written by Jincy Kornhauser at Pearson Tutor Services. Published on March 25, 2014 by Guest.